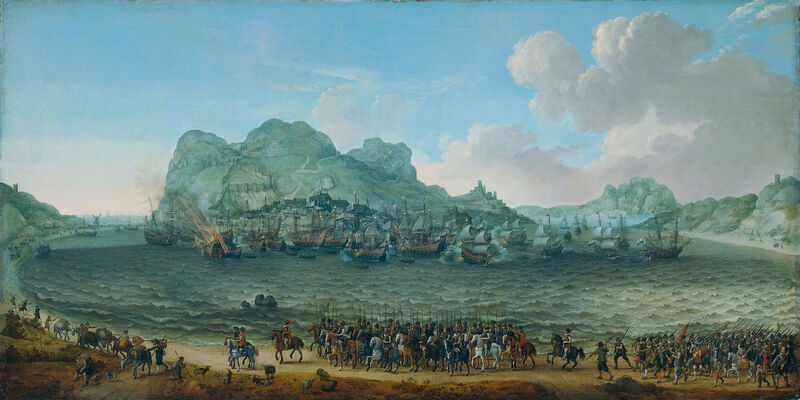 The Battle of Gibraltar by Cornelis Claesz van Wieringen. Oil on canvas. Rijksmuseum, Amsterdam. 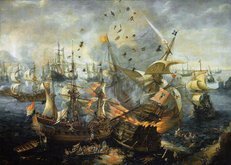 The naval Battle of Gibraltar took place on 25 April 1607 during the Eighty Years' War when a Dutch fleet surprised and engaged a Spanish fleet anchored at the Bay of Gibraltar. During the four hours of action, most of the Spanish ships were destroyed. A Dutch fleet of 26 warships was led by Jacob van Heemskerk. The Dutch flagship was Æolus. Other Dutch ships were De Tijger (The Tiger), De Zeehond (The Seal), De Griffioen (The Griffon), De Roode Leeuw (The Red Lion), De Gouden Leeuw (The Gold Lion), De Zwarte Beer (The Black Bear), De Witte Beer (The White Bear) and De Ochtendster (The Morningstar). A Spanish fleet of 21 ships (according to the Dutch) or 10 ships (according to the Spanish), including 10 galleons, was led by Don Juan Álvarez de Ávila. The Spanish flagship San Augustin (St Augustine) was commanded by Don Juan's son. Other ships were Nuestra Señora de la Vega (Our Lady of Vega) and Madre de Dios (Mother of God). The Spanish fleet was covered by a fortress, although the Dutch fleet was out of range of its guns at all times and they could not intervene in the battle. Van Heemskerk left some of his ships at the bay entrance to prevent the escape of any Spanish ships. 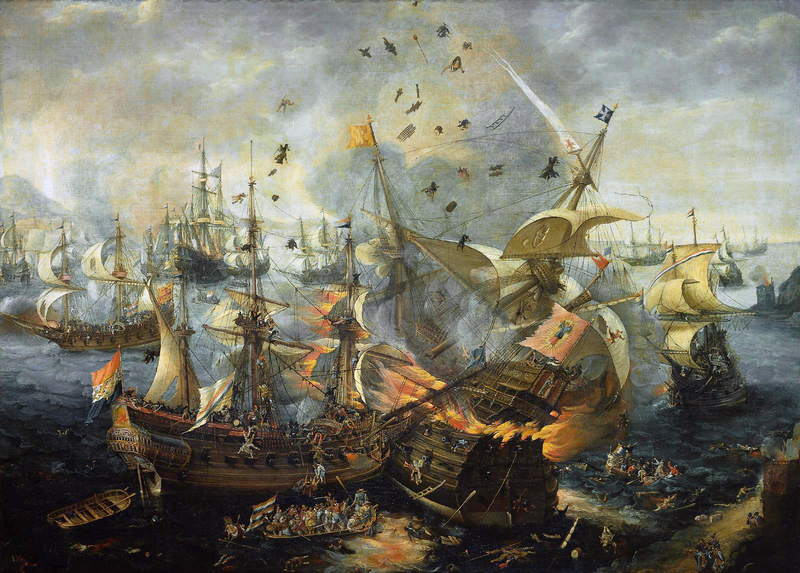 Twenty from the Dutch fleet were ordered to focus on the Spanish galleons while the rest attacked the smaller vessels. Van Heemskerk was killed during the first approach on the Spanish flagship as a cannon ball severed his leg. The Dutch then doubled up on the galleons and a few of the galleons caught fire. One exploded due to a shot into the powder magazine. The Dutch captured the Spanish flagship but let it go adrift. Following the destruction of the Spanish ships, the Dutch deployed boats and killed hundreds of swimming Spanish sailors. The Dutch lost 100 men including admiral Van Heemskerk. Sixty Dutch were wounded. Depending on the sources, most or all of the Spanish ships were lost and between 3500 and 4000 Spaniards killed or captured. Álvarez de Ávila was amongst the dead.